Oswald de Lacy is Lord of Somershill Manor. 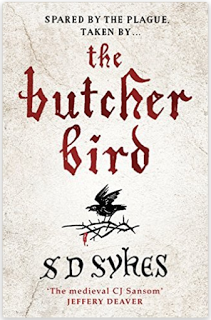 After a dead baby is discovered impaled on a thorn bush, the locals are convinced the culprit is the terrible Butcher Bird which was released when villager John Burrows opened up the casket of his dead wife. Oswald however, dismisses their anxieties as superstitious nonsense and despite the doubts of those around him is determined to discover who is really behind the child’s death. Oswald is a great character; he constantly battles against the embedded beliefs of those about him. He is a just leader, treating everyone with respect, even those who prove him wrong. He is a patient man but he has his work cut out now as he goes about getting to the bottom of this mystery. I loved the whole feel of this book; the characters, the story and the way it unfolded. I particularly loved Oswald’s interaction with his bossy mother and tetchy heavily pregnant sister, each with their own issues. This isn’t just a medieval thriller, it gives the reader far more than that – humour and great characters who’ll you’ll either love, hate or be totally exasperated with. I’m not one for spoilers, so it’s all about reading the book to find out for yourselves exactly what Oswald’s detective work uncovers. However, please do read this because it is a really entertaining book. My only regret? That I didn’t get an earlier introduction to Oswald by reading Plague Land…I’m about to remedy that now. I would like to thank the publisher for a complimentary copy of this book in return for an honest review.